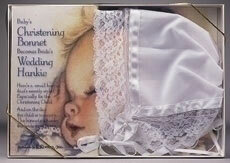 This Baby Bonnet "Hanky for Baby", is a very meaningful gift for the sacrament of baptism or christening. It makes a very sweet heirloom bonnet for the new baby - a great choice for a baby shower gift! A tiny square of linen And a dainty edge of lace, Designed into a bonnet, To frame your baby’s face. After baby’s worn it Fold and tuck away... And it becomes a hanky For your daughter’s Wedding Day. 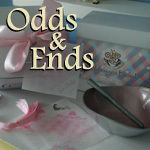 Or if the baby is a boy, On the day he marries This can be the “something old” His joyful bride will carry.